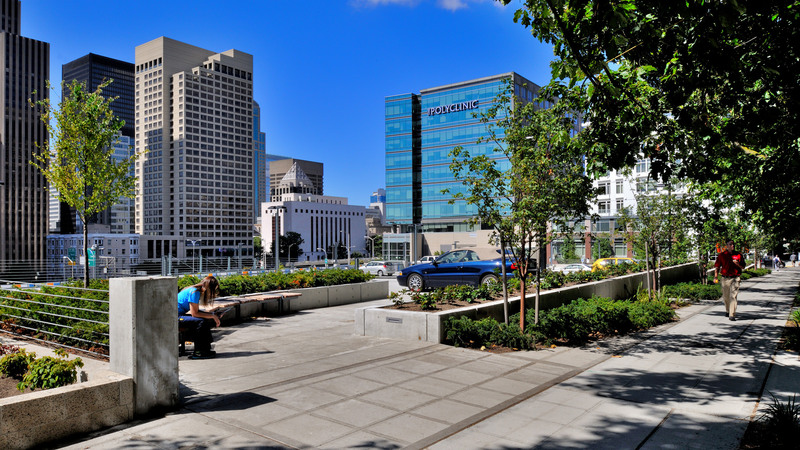 The north pocket park located at 8th Avenue and Marion Street offers a spot to enjoy the view of the downtown. The parking garage and surface lot are terraced to follow the slope of Columbia and Marion Streets. With the bulk of the garage structure hidden below grade, the entire development is designed to minimize bulk of the structures and to maximize views from the streets to downtown. Stepping along the hillside and occupying a full city block, this parking structure and surface lot merge with terrain to conceal the bulk of the garage. Generous planters and rain gardens ring the development, bringing human scale and natural materials to sidewalks. While meeting The Polyclinic’s need for parking, this project also restores a neglected urban site. The jumble of curb cuts, chainlink fences and abrupt grade drops that constituted the former surface parking lot are replaced by parking terraces with pedestrian-oriented edges and colorful screens. The top parking deck steps back from the street to make room for a tree alley that frames views of downtown and provides a leafy canopy for neighbors strolling through. 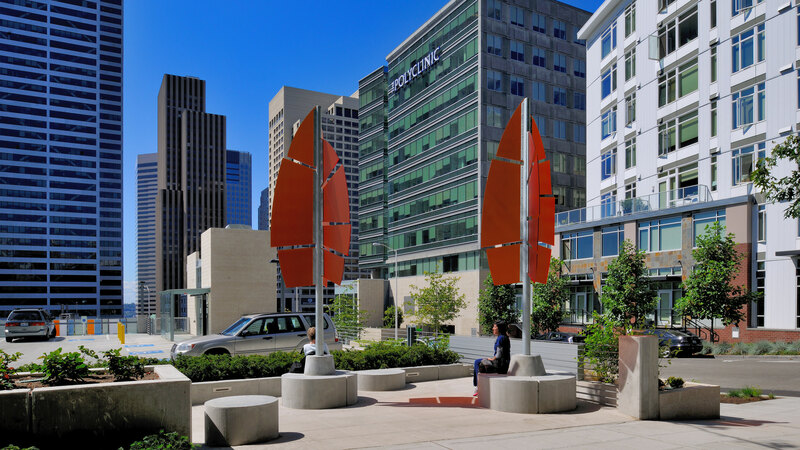 Pocket parks inserted at the corners of the garage structure offer seating and public art. Car-centered by nature, this development greatly improves human experience.